Going to the gym can be tough, especially when you have a full-time job, family and busy social life! Volkswagen Commercials Vehicles are here to help. Recent research by Volkswagen Commercials Vehicles and the NHS tells us that the average van driver aims to work out twice a week, however life on the road can be challenging and can lead to less than ideal nutrition and exercise routines.Hours of sitting can slow the metabolism – which affects the ability to regulate blood sugar and blood pressure, and metabolise fat – and may over time, contribute to weaker muscles and bones. 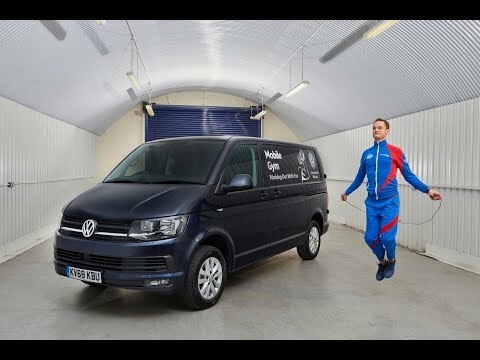 We are pleased to share the Volkswagen Commercials Vehicles unique “work out with you” unique exercise regime that van drivers can do anywhere, anytime, with its mobile gym! There is no need for that expensive gym membership and loads of costly gym equipment when you have body panels and load bay with the bumper dips and panel push-ups plus everyday tools and gear stored in the racking with moves like the pipe clean & press and toolbox squat & raise. Let us know what you think and if you would try this in your Volkswagen Van!